Simply spectacular... and what a way to cap a night and a trip for that matter. 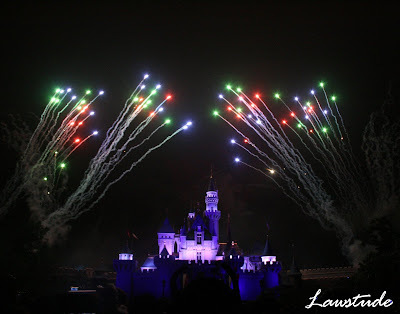 Hong Kong Disneyland's Fireworks show is probably the best integration of a Castle into a an amazing fireworks display. Happening everyday at about 9 pm, Disneyland HK wanted to prove that they have the best fireworks display among all Disney Theme Parks. Well, I should agree, I mean China is the fireworks capital of the world. Fireworks and pyrotechnics are co-ordinated to orchestrated classic Disney music and tunes that most our kids (and us) remember by heart like A Whole New World, When You Wish Upon A Star, Circle of Life and others. For about twenty minutes, all activities in the park stopped and everyone just find their place in front of the castle or elsewhere in the park and just marvel and watch the fire works display. With this I end my Hong Kong series. I went to Hong Kong on a very tight work itinerary and really wasn't expecting to explore much. The smog condition affected most of my shots do I deemed it proper not to share them at this time. Plus, the non-stop raining prevented me from further walking-my-way around the City. Nevertheless, It was still a fun trip mostly because of Disneyland. I know I am too old for that stuff but hey, changes are sometimes good. I never been to any Disneyland Park before so I grabbed this opportunity to see Mickey and the Gang up-close lol. Although I must admit, I still prefer the natural beauty of nature and would not mind getting my feet all wet and muddy just to capture its essence. A spectacular show indeed. I love it. You did a good job capturing the fireworks! Galing galing ng shots, Atty! Anong gamit mong camera? What a way to end the series. Fireworks talaga eh. Where to next? That was fun. It was like New Years Eve at the middle of the year. Wow the fireworks are so beautiful and amazing. Your post remind me of Michael Jackson's hair burned by explosives. Now I think the next time I better wear a cap while watching fireworks. Makes me want to hop on a plane and go there right now. Exquisite shots! Your post makes me wanna go to Disneyland right now. Or better yet, go to Bulacan and buy fire crackers. everything are spectacular in disneyland. Spectacular shots of the crackers. The building in the light of crackers looks awesome. Wow! fantastic fireworks! galing mo talagang kumuha ng picture..
great post to end this series! i like the red flares! ugggh! i sooo love fireworks and i'm really really jealous! hahaha! dito ako iniingit ng prinsesa ko nung pumunta sila sa disney. hay nako...napakaganda pa ng shot. A great finale... all the pictures are spectacular and so colourful... well done! Awasome and spectacular show indeed! LS: Marvelous job of capturing the event. Your timing was spot on with these shots. Wow, spectacular fireworks indeed but so are your photographs. They are brilliant!!!! Thank you for sharing them. But this is one more good reason to come back again. WOW! I've never seen such beautiful fireworks. This must have been spectacular in person! And I think I saw Tinkerbell up there amongst the sparkling crystal fireworks...waving her wand and granting wishes...beautiful! What a beautiful light show! Some of your other shots of Disney and all I want to say is some things are just freakish! I enjoyed your pictures! LOL. this is what takes up soooo much space in my camera, I remember doing some 200 shots for the fireworks. LOL. now i've learned my lesson to select which to shoot. Nice shots! Wow.. I just looked back over all of your HK Disney photos and they're wonderful. You have certainly captured the colour, action and magic of such a place. Great posts! Indescribable feeling especially during the show.